A museum to the service of the school and the didactics. 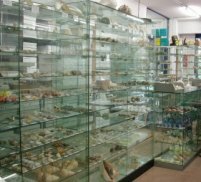 One million of shells, dinosaurs, crabs, sharks, coral, pearls, madreperla and masks. The Museo Malacologico, entertained in a modern structure of 3.000 mq, is long SS16 of the inhabited center of Cupra Marittima, in the heart of the Verde Riviera Picena, equidistant between Ancona and Pescara. Principal distances: S. Benedetto del Tronto. 10¹, Ripatransone 15¹, Fermo 25¹, Ascoli Piceno 30¹, Montefalcone App. 40¹, Loreto-Recanati 35¹, Coast of the Conero 40¹, Ancona 60¹, Frasassi 75¹. Station FS to 2 km. Urban line 6 (S. Benedetto del Tronto, Grottammare, Cupra Marittima). The Museo Malacologico can be visited to every schedule of the day previous telephone booking (0735.777550 or 347.3704310). The museum is also visitable in the festive days. The indicative time of visit is of 2 hours. The direction of the Museo Malacologico can telephonely be contacted, during the normal schedule of opening (mar. gio. sab. and dom. 15.00 19.00) to the number 0735.777550. The telephone of the Museum is always operational 347.3704310. 12 expositive sections prepared on the two floors of the museum. A library with over 3000 preserved volumes. The most important malacological Piastrelloteca existing to the world. Posting equipped with VCR and thematic videocassettes. A shop with over 20.000 scientific articles in sale, besides books and magazines. An ample parking for Scuolabus, Pulmann and cars. Hotels and restaurants in the ray of 200 meters. Beach and mouth of the River Menocchia to 100 meters. Didactic ability for 350 students contemporarily. Green classroom, in the heart of the Sea Park of the Piceno. To the teachers responsible of the students in visit will be given a "Guide" to cards that it represents a tool of synthesis of the didactic visit to the Museo Malacologico of Cupra Marittima. The teachers that accompany the students to the Museum have free access. Among the illustrious visitors that have appreciated the scientific wealth of the Museo Malacologico of Cupra Marittima during the 30 years of life of the Museum, Alberto Angela occupies a position of prestige. 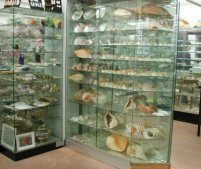 Over a million visitors have crowded the rooms of the greatest existing museum to the world and devoted to the shells. Students of every order and degree, coming from Europe, have discovered the secret of the malacology to Cupra Marittima. 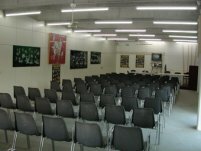 The Museo Malacologico, has didactic space that can entertain up to 55 students and of a great classroom with an ability of 180 places to sit. To the students in visit to the Museum a specialized teacher illustrates the elementary bases of the malacology, answering to the questions of the students and modulating the lesson in base to the age of the pupils. The introductory lesson to the visit is followed by the projection of a naturalistic malacology tape of the duration of around 20¹. The Museo Malacologico, is the more existing main point to the world, with 900.000 finds exposed in a "forehead-showcases" of 1800 meters. The reliquaries are predisposed for an optimal vision and for the best guardianship of the museal patrimony. This section is of sure interest to understand the evolution. Fossils rto the Ordoviciano (500 million years) and representative some following Eras are not able whether to arouse great interest. Aquatic dinosaurs and earthlings, admonished, rests fossils of invertebrates and vertebrates occupy the first part of the museum. Ample space is devoted to the actual shells, exposed in systematic order. The great variability of forms and colors it fascinates the visitors and it is testimony of the biodiversity. Shells of the whole world, harbors, earthlings are exposed, from the smallest dimensions (as soon as a millimeter) to the gigantic Tridacna gigas that overcomes the 200 Kg of weight. A spectacular section is devoted to the "madreperla" and to the artistic manufactured articles that exploit the iridescence of certain manufacturing shells of pearls. Objects are exposed and realized all over the world; a particular space is devoted to the "lacquers" Vietnamese and to the manufacture of the "buttons." Embalmed animals, also with great dimensions, gigantic jaws of sharks, and crabs of depth deal the habitat of the molluscs. Particularly fascinating the madrepora formations exposed to the Museo Malacologico. Spectacular is the section devoted to the role of the shell with manufactured articles realized all over the world,; particularly mysterious and fascinating is the collection of the masks coming from the Sepik in Papuasia.